•	Three phase control autotransformers offer a fast and simple way to convert standard line voltages to those required for small loads and small motors. 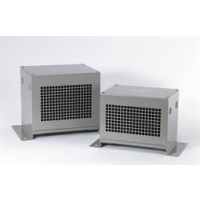 •	These compact, NEMA-1 enclosed autotransformers are Y-connected and come equipped with clearly labeled fiberglass terminal boards with solidly fixed terminals in order to facilitate the installation. •	Unlike connecting multiple buck-boost type transformers, there is no complicated internal wiring to carry out nor any conversion charts to decipher. •	In common with all other autotransformer installations, the loads are not isolated from the line and caution must be taken to ensure the load doesn’t contain any electronic controls or computer loads. •	Available up to 3000VA (3kVA) with a full range of line and load voltages.